Squeezed inside the empty closet of an upstairs bedroom of a Herndon townhouse, Derek Meitzer leans into an upright microphone, ready to flow. You have to start somewhere. Besides, this totally beats Iraq. 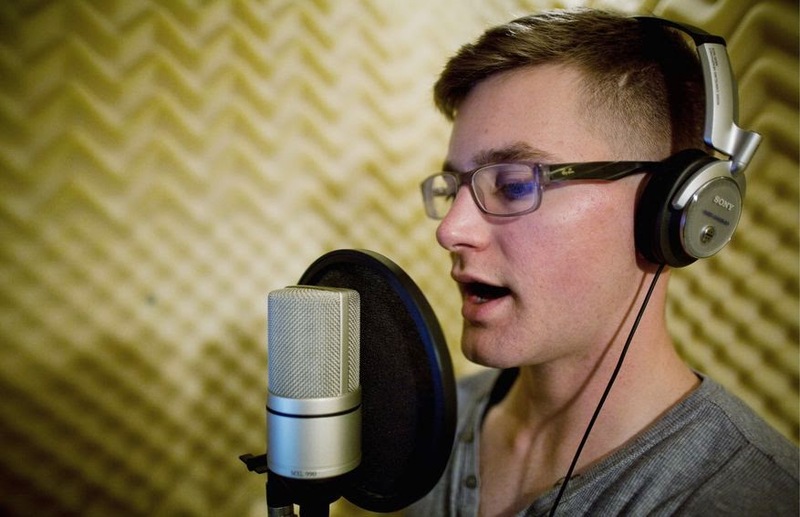 An up-and-coming rapper in D.C.’s underground scene, Mr. Meitzer also is a lance corporal in the Marine Corps, a combat videographer stationed at Marine Corps Base Quantico in Virginia. Yellow noise-dampening foam covers the walls. Posters of Biggie Smalls and the movie “Scarface” paper the ceiling. This is Jason's studio, where Mr. Meitzer is recordinga song he just wrote, about coping with a friend’s suicide. One take becomes two. Two become three. Five minutes becomes a half-hour. Peering through his glasses, Mr. Meitzer holds a laptop computer in his left hand, reading lyrics off the screen. Grinning, he flexes his left arm. In some obvious ways, the two worlds are incongruous — hip-hop fantasies of Bentleys and champagne rooms colliding with military realities of Quonset huts and meals ready to eat; individual swagger and hedonism butting heads with patriotism and exacting small-unit values like self-sacrifice and mutual loyalty. And yet, for the 25-year-old Mr. Meitzer, rap and soldiering are — unlikely as it might seem — mutually inclusive. During his 4½ years of military service, Mr. Meitzer has released three albums. Dropped rhymes in New York City, the Philippines and the Persian Gulf. Represented D.C. in a national competitive rap league. As an artist, he lists Jay-Z and Bob Dylan as major influences. His oeuvre combines hip-hop, jazz and folk music. When performing, Mr. Meitzer likes to wear bow ties. Mr. Meitzer isn’t the first hip-hop artist with military ties. Ice-T once served in the Army. MC Hammer was in the Navy. Following 9/11, rapper Canibus enlisted in the Army, despite being 28 at the time. Performing with the stage name Solider Hard, former Army gun-truck commander Jeff Barillaro raps about post-traumatic stress disorder, friends being killed by roadside bombs and the dissolution of his marriage following overseas deployment. Mr. Meitzer concurs. He wants his music to raise awareness of veterans and help bridge what he sees as a psychological gap between soldiers and the rest of society. Rise at dawn. Run six miles. Breakfast. Office work. Lunch. Shoot photos and video. More paperwork. Dinner. Back to barracks. By day, Lance Cpl. Meitzer lives like any other Marine. At night, he becomes his rap alter ego, D’Meitz. When the Cleveland native entered basic training in early 2007, he already had dropped out of Kent State. He wanted to support the nation’s war efforts. Mr. Meitzer’s grandfather served in the Army and was stationed in Germany during the Korean War. His father was in the Navy and completed two tours during the Vietnam War. A regular on the Cleveland underground rap battle circuit as a teenager, he self-released his first album in 2009 while stationed overseas, then persuaded disc jockeys in the Philippines and Okinawa, Japan, to play it. During a 2008 tour in Iraq, Cpl. Meitzer entertained troops with his freestyle verses; a series of YouTube videos show him performing in a trailer on an air base in Al Asad, wearing fatigues, producing laughs and dropped jaws with his playful, rapid-fire, family-unfriendly lyrics. A different theater of conflict: the Island Cafe in Northwest Washington. Early March. Packed house. Ball caps and bottled beer. In one corner: Richard Cranium, a battle rapper from Atlanta wearing a button-down shirt under a dark gray hoodie. In the other? D’Meitz. Wearing, of course, a bow tie. Three rounds. Five judges. One objective: outrap — out-disrespect, really — the other guy. Best MC wins. Cranium wags his finger. Curses a lot. Rhymes even more. Likens D’Meitz to Doogie Howser, M.D. Looks scornfully at Mr. Meitzer’s outfit — glasses and an argyle sweater. “Why has Malcolm in the Middle been dressing like Malcolm X?” he asks. Back and forth it goes, the swapping of creative and creatively profane insults. The crowd oohs. They laugh. Let loose with a few daaaaamns! In his last verse, D’Meitz mimics Cranium’s quick rhyming style, then drops an intricate series of bars referencing Greek mythology. D’Meitz wins. Afterward, the two shake hands. Mr. Meitzer competes for GrindTime DMV, the local division of a national rap league that matches rappers from across the country, then posts footage of their tete-a-tetes online. For Mr. Meitzer and others, the league provides an opportunity to travel, network and get much-needed exposure: Uploaded in July, the Cranium-D’Meitz match already has registered more than 30,000 views on YouTube. Jason, who works as a corporate vendor andmanages GrindTime DMV alongside Skillz “Paradoxx” Ferguson, said Mr. Meitzer averages about 20,000 online viewers per contest. Mr. Meitzer got his start in hip-hop as a 13-year-old battle rapper in a Cleveland church league. As a teenager, he represented his hometown against a team from Detroit, then joined the Detroit team to take on a team from New York City. After arriving at Quantico, Mr. Meitzer auditioned for GrindTime DMV at a rap battle in Baltimore. He since has competed in England and Canada. His Marine background, he said, is an advantage. An old military axiom holds that war is 90 percent boredom and 10 percent sheer terror. In Iraq, Cpl. Meitzer experienced a bit of both. Terror: hiding in the belly of an airstrip excavating machine during a mortar attack in Rawah, camera in one hand, rifle in the other, flush with adrenaline, a siren drowning out his heartbeat, realizing that if death comes, it comes. Boredom: sitting atop a dirt hill, alone, for 30 minutes a day, watching ants fight giant beetles, the beetles flicking the smaller ants away, the ants eventually flipping and disemboweling their larger foe. While attending Kent State, Mr. Meitzer dreamed of owning his own production company. And a modeling agency. And a private island, with a moneymaking cruise line business in the event of climate change. He attempted to set a world record for the longest freestyle rap. (Two-plus hours, he recalls.) He owned a set of diamond-encrusted gold teeth. Today, he’s studying music management online. Applying to colleges in New York City. After he leaves the service, likely in November, he wants to live in hip-hop’s Mecca — but also earn a degree in international relations. That’s the steady thing. The realistic bet. A regular career.